The human genome has two alleles of any gene. An allele may be dominant, recessive or co-domainant. Only one copy of an allele is needed for a dominant allele to express. A recessive allele expresses only when both the alleles are recessive. The A and B blood group allele is dominant over the O group but are co-dominant with respect to each other. Individuals having genotype AA or AO express the A blood group antigen. Similarly individuals having genotype BB or BO express the B blood group antigen. An individual having genotype AB express both the blood group antigens. O is a recessive allele and only individuals with genotype OO have blood group O. The biochemical basis of the ABH system is modification of the H antigen by enzymes encoded by the genes of blood group substances. Addition of N-acetylgalactosemine by the glycosyltransferase encoded by the allele encoding for A blood group converts the H antigen to A group antigen. Similarly the addition of galactose results in the synthesis of B group antigen. The allele for O group has a mutation and does not add any sugar. Recessive genes are genes with mutations that result in loss of function. This is the case with the O blood group gene or with a thalassaemia gene. If recessive allele is present in the heterozygoyus state the product of the dominant allele, which encodes a functional protein, ensures there is synthesis of functional protein. The levels of encoded proteins in the presence of a mutant and recessive gene may be lower than in an individual without the mutant gene. Normal function is possible even with reduced levels of the encoded protein in almost all individuals and no disease occurs. This is the case with individuals with thalassaemia trait who have lower haemoglobin than normal individuals but this does not cause symptoms related to anaemia. Some genes that encode for non-functional proteins manifest even when heterozygous with a functioning gene. These genes are known as dominant-negative. These genes usually encode for proteins that are dimers or multimers. The recessive gene has the ability to “poison” the components of the dimer/multimer produced by the normal genes and render them functionless. Recessive genes encode for proteins that cannot form dimers/multimers. The product of these genes has no effect on the activity of the protein encoded by the normal allele. The levels of proteins may be reduced but all the protein synthesized by the dominant gene is functional. Usually the levels of proteins fall to half that in normal. This is almost always sufficient for normal function. 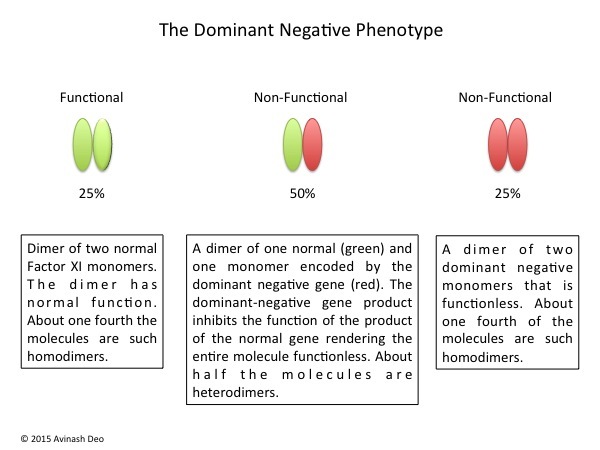 The dominant-negative genes have the capacity to form dimers/multimers and also also have the capacity to inhibit the function of the product of the normal gene (figure 1). A patient carrying a dominant-negative allele has reduced levels of functional proteins because of inhibition of function by the product of dominant negative allele. If one considers a patient who has a dominant negative mutation for a protein that is a homodimer, as is the case with factor XI, 75% of the factor XI synthesized will have the monomer produces by the dominant negative gene, Only 25% of the factor XI will be functional. This is consistant with the observation that these patients have factor XI levels between 20-30%. The situations in multimeric proteins and those proteins that are hetrodimers/hetromeltimers is more complex but the principle remains the same.